There’s an almost palpable feeling of anxiety carried by parents when you step on to a plane with a baby. It’s actually something that starts to simmer as soon as you book your ticket. This feeling was particularly strong when boarding our recent Qantas Dreamliner Business Class flight from Melbourne to Los Angeles; our first long-haul flight with our five-month-old daughter. Our fears were immediately eased by warm smiles, introductory handshakes and an all important glass of French champagne thanks to the friendly Qantas crew. As we were flying through from Brisbane, we checked in at the Premium Lounge Entry check in at Brisbane airport which takes you directly through to Qantas Club and Qantas Business Lounge. Business Class passengers in Melbourne are given access to the Qantas International Business Lounge, located Airside, Level 1, via departures concourse. As a Qantas Platinum Frequent Flyer, we were able to enjoy a drink and a quick bite to eat at the Qantas First Lounge in Melbourne, where the food and the service were second to none, as expected. We were seated in the smaller business class cabin so we had access to a bassinet but no doubt also so that we were spaced away so as not to disturb their regular frequent flyers at the pointier end of the plane. We were seated with another family of four which strangely gave me more comfort as we were flying with a baby. 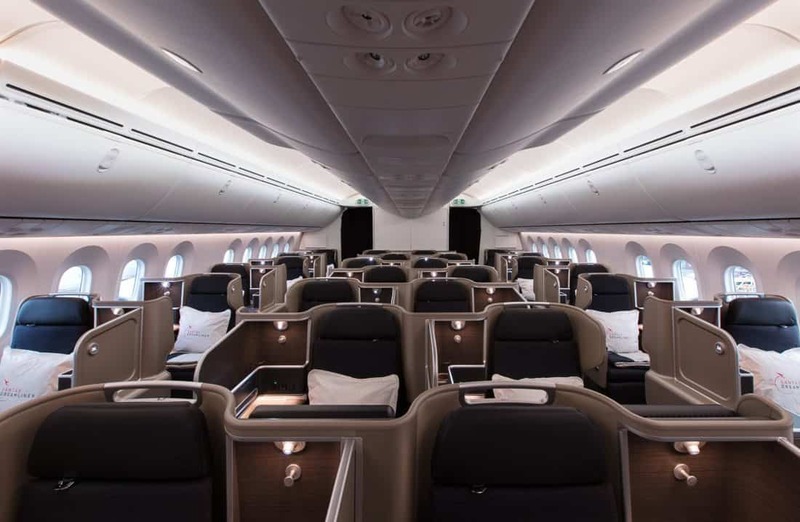 The cabin seat configuration is 1,2,1, meaning every passenger has direct aisle access from their B787 business suite. I was seated in 10E as it had the bassinet. If I was travelling alone, my pick of the cabin would have been 10K as it had the bulk head seating cubby and full privacy screen to the aisle. I expected the seats to be spacious, given they are described as Business Class Suites but I was pleasantly surprised at just how much room we had, particularly given all of the extra items I was carrying for the baby. The suites are particularly private too, with a screen between the middle seats (ours was broken, however it didn’t bother us as we were travelling together). The Dreamliner Business Class seats are fully equipped with every possible comfort from a semi-recline setting for take off and landing, a two-metre long lie flat-bed which creates a private, pod-like feeling, ample storage for electronics and carry-on items, a do not disturb light, in-seat charging for personal electronics, a reading light and mood lighting (which came in very handy when feeding a baby). The Qantas Business Class amenities feature unique local artists’ designs as part of the collectible series. The pack includes the standard mask, toothbrush and toothpaste, socks, ear plugs and Aspar toiletries that also feature in the bathrooms. As usual, the menu curated by Neil Perry was impressive. Although, travellers can’t yet dine on request, there is now the option to choose your meals online before the flight. Supper was served just after take off with a couple of options cleverly marked as lighter choices that are delivered straight away so you could “sleep sooner”. The Sleep Sooner menu includes a selection of cheese with accompaniments and a Poached chicken breast with kale, edamame and grain salad and a few other options. I opted for the Beef fillet with soft polenta, caramelised onion and sage, slow roasted tomatoes and rocket. It also came with seeded bread served with Pepe Saya butter and a Green leaf salad with Rockpool vinaigrette. Andrew ordered the Seared Cone Bay Barramundi with herbed garlic potatoes, broccolini, Lemon Olive and Almond Salsa. While we had enjoyed glass of Duval-Leroy Brut on boarding, when we asked for another with the meal it was seemingly nowhere to be found, so a glass of sparkling wine was served in its place. For dinner (or breakfast as it were) coming into Los Angeles, I enjoyed the Baked egg, Gruyere and bacon tart, tomato relish, cos, tomato and cucumber salad and Andrew chose the poached eggs with kale, haloumi and pistachios. We both enjoyed a nice strong Australian-style coffee before stepping off into the land of Starbucks. Of course, a range of snacks such as pastizzi, chips, chocolate and sandwiches, non-alcoholic and alcoholic drinks are available throughout the flight from the self-service bar located between Business Class cabins or delivered by the crew. As expected with Qantas, the service was fabulous, with each member of the crew making us feel welcome and well taken care of which is something we particularly appreciated as this was our first long-haul flight with our daughter. Having finally surrendered to sleep while waiting to board, we carried her on and strapped in, mid-slumber, hoping she would stay so for the hours that followed. Thankfully, when the plane took off we were able to transfer her to the bassinet, without issue and she continued to sleep for the next 5 hours, which was no doubt a relief for both ourselves and the surrounding passengers. The bassinet was built into the bulk head right in front of my seat. The cover popped out and locked into place and the baby is set into the bassinet with a baby seat belt placed across them. Cleverly, there is also a mirror set into the cover of the bassinet to allow parents to check their babies without having to get up from their seats. I found the mirror hard to use, particularly given we were on a night flight and the cabin lights were dimmed, so I was jumping up all the time from the seat, which wasn’t really a problem for me. We chose the seats in the middle section so we could both attend to our baby but found Andrew had to walk around to my side to reach her properly from the bassinet. While having the change table easily accessible in our nearest bathroom, it was a slightly narrow leaf-like shape and somewhat difficult to use. The crew was very accommodating when it came to anything we needed for our daughter and checked in often. We never felt like we were imposing, even when I buzzed for fresh bottles of water for her bottles in the middle of the night. Surprisingly too, we both got some sleep on this flight which for all new parents is simply invaluable. We are looking forward to travelling with Qantas again as a family.